← I have a million things to do…so naturally I’m starting a blog. I admit it, I’m a compulsive hair dyer. I love changing my hair color to fit the seasons, dark in the winter, light in the summer. However, the past weeks warm weather has inspired me to try again to return to my natural light brown, blondish color. So while I sit with this lightening cream burning my scalp, I thought I’d make a post. Living life in an apartment style dorm with Celiac disease is hard. I am forced to cook all my own meals due to the lack of gluten free options in our student center. Even when I do eat something that is technically gluten free, I seem to feel sick. Maybe its cross contamination, maybe its all in my head…who knows? I’m lucky in the fact that the grocery store closest to me, that also accepts my Rowan Card as cash (thanks to my dad for consistently donating to my grocery fund), has a pretty good selection of gluten free options. 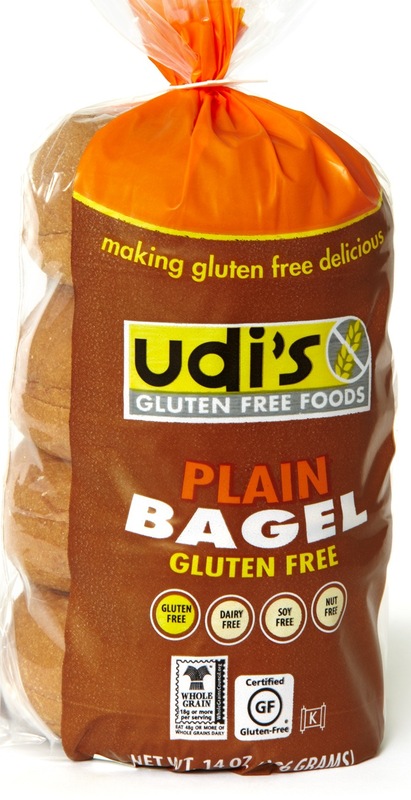 My life saver has become Udi’s Gluten Free bagels. I’m a bread lover, unfortunately I have had to give up that passion since my diagnosis. One of the things I have missed dearly was bagels, but I had a beautiful discovery a week ago in the organic section of the freezer isle . I saw these beautiful things staring at me from the bottom of the freezer. I excitedly texted the man in my life, and he didn’t understand why I was so enthusiastic about finding bagels. Now being that we have recently started dating, he has been incredibly supportive of my gluten free lifestyle, but sometimes he just doesn’t understand what it is like to have lost the ability to eat whatever you want. Udi’s is not only the maker of the new staple in my diet, they also have a community where people can discuss their gluten free lifestyles. Their webpage offers recipes, a store and restaurant finder, and a list of their products. Their Facebook page is also very active. Its nice to see the support out there from companies who produce gluten free products. I am a recently diagnosed Celiac living in Glassboro, NJ. I am attending Rowan University for Law and Justice with a minor in Psychology. This entry was posted in College, Cooking and tagged Bagels, Celiac, gluten free, Hair Color, Rowan University, Udi's Gluten Free. Bookmark the permalink. 2 Responses to Attempting to go blonde….again! I’m so glad you were able to find our bagels! I eat them toasted with peanut butter and a banana. Thanks for writing about them and linking back to our site!